Dr Abdulwahab Al-Sadoun received a Ph.D. in industrial chemistry from King’s College, University of London, United Kingdom, and is a graduate of the General Management Program of the Harvard Business School, Harvard University, USA, and of several executive management and technical training programs at leading institutions in Japan, the United States, and Europe. Al-Sadoun began his career as a senior researcher at SABIC Research and Development Center in Saudi Arabia. He then worked for several of the most prominent agencies in the region, including Saudi Arabian General Investment Authority (SAGIA) and the Gulf Organization for Industrial Consulting (GOIC). Since 2009 he has served as secretary general of the Gulf Petrochemicals and Chemicals Association (GPCA). 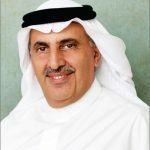 He is also a member of the Steering Committee of the International Council of Chemical Associations (ICCA) and the Board of Trustees of the Riyadh Economic Forum and the Arabian Society for Human Resources Management (ASHRM). Dr. Al-Sadoun is the author of over twenty-five articles on the regional petrochemical industry published in refereed international journals and is the co-author of two U.S. patents.